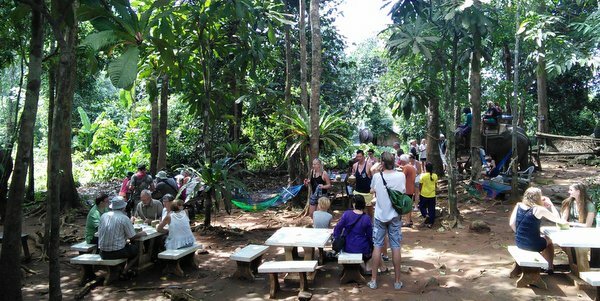 Ban Kwan Chang, generally considered to be the best elephant trekking camp on Koh Chang, is located in Klong Son at the end the narrow road that leads to the waterfall, Klong Jao Leuam. Some 15 years ago, Pittaya Homkrailas set up the original Ban Kwan Chang on a small piece of land near the turning to the main Koh Chang waterfall at Klong Plu, with the camp’s only two elephants clearly visible from the road. Whilst this might have been good for business, it soon became apparent that the proximity of the traffic upset the animals and it was a situation that would only worsen as Koh Chang developed. He, therefore, took the decision to up sticks and move the camp into the interior, an environment well away from the hurly bury of island life. Happily, things have flourished and today the camp, now located deep in the forest, has ten contented, well cared-for elephants overseen by their 10 friendly mahouts. 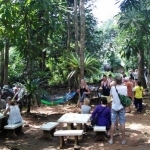 At Ban Kwan Chang, bookings are taken as either 1 hour or 2 hours, with the 1 hour a trek only and the 2 hour, the trekking of course, but this time followed by swimming and washing with the elephants in a small river. 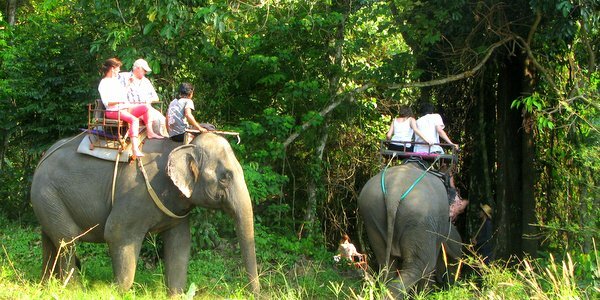 The trek itself takes about 45 minutes, heading off into the natural forest and the rubber trees surrounding the camp, with you sitting on the two-seater chair that is lightly strapped to the animals’ back. 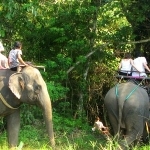 As the trek progresses, the mahout will offer you the chance to sit right behind the elephant’s head and ears. Nothing is too strenuous so it’s fine for small kids and oldies and there are plenty of photo opportunities too. On your return, you get to treat the elephant with some snacks. Pineapple stalks seem to hit the spot and explain why you may have noticed small trucks piled high with them on the ferries. If you go for the 2 hour session, after the trek, you walk with the elephant down to the river, so that everyone can cool off. The elephant is led into the water first and once fully submerged, you get to join her. The animals are happy for you to clamber on board, love having their necks scrubbed and may even paddle off themselves for their own bit of fun. It takes about 30 minutes to complete the ablutions. Trek or swim and trek all finished, Ban Kwan Chang then delivers you back to your resort. Ban Kwan Chang runs four trekking sessions a day, with times of 09.00am, 11.00am, 13.00 and 15.00, with a free pick up/return to and from your resort, all areas up to Bailan Beach. Costs are 850bt per person for the 1 hour, with the 2 hour at 1,500bt. Children under 10 are 500bt and 800bt respectively, under 3 are free. There is no restaurant on site but water, coffee and tea are complimentary. If you sign up for the swimming and washing with the elephants and why not as it’s a lot of fun, wear something suitable as you will get wet. Please click on an image to scroll through the gallery. Ban Kwan Chang is associated with Friends of Asian Elephant Foundation (FAE). The camp’s manager, Panya, is also its resident artist and his paintings and small prints are available for purchase.